I love sunshine the most, but I’m fond of occasional days like today, too. It’s a moody day, damp, chilly, and gray. We’ve reached the penumbra of Christmas, and I, for one, am actually feeling calm and ready for it. The high point of Black Friday/Cyber Week for me was scoring a space heater for my parents on a ridiculous sale at Home Depot. You know you’re a grandma at heart when your proudest consumer extravaganza moment is a space heater. It was such a good deal, and we really needed it! Hopefully this will be the last time we’ll have to think about heating my parents’ room when they visit in the winter, since the A/C guy is coming next month to address the ventilation issue. Anyway, let’s get right into some of my favorite Little Things from November! 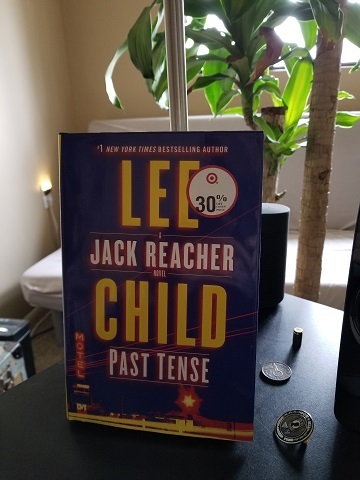 Past Tense (2018 Jack Reacher novel by Lee Child). Okay, Lee Child’s 2018 Reacher might be one of my favorite Reachers ever. I just really enjoyed this novel. I found it to be deliciously taut, intriguing, and twisted, and I loved the Sumo comparison Child wrote into one of the bad guys! Incidentally, I’m as thrilled as any Reacher fan that Lee Child is planning a Jack Reacher streaming series… and that Tom Cruise will not be cast as Reacher! It also came to my attention that Child is open to suggestions for Reacher actors! I’m going to dedicate next week Tuesday’s post to my ideas for this. 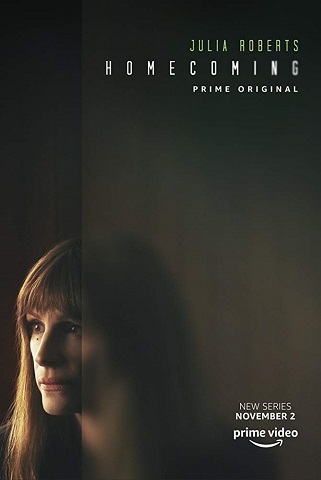 In case you didn’t know: Amazon Prime Video released this original series called Homecoming, and it would be well worth your while to check it out if you’re into intrigue, military themes, and Julia Roberts. Speaking of Reacher, this guy! Richard Madden! A few of his scenes in Bodyguard made me shout “HE IS REACHER.” Not fight scenes, mind you. It was more these little, transitional moments in which the character would reply to someone, move between places, or stand and allow a certain mood to arrange his features in a Reacher-like fashion. It was about attitude and the air about him, I guess… subtle and important qualities. There’s more to Reacher than 6′,5″ and and 220 lbs. Spoiler alert for Tuesday’s TALC post: Madden didn’t make my short list of potential Reacher actors (no pun intended). Dommage. But I wildly digress. 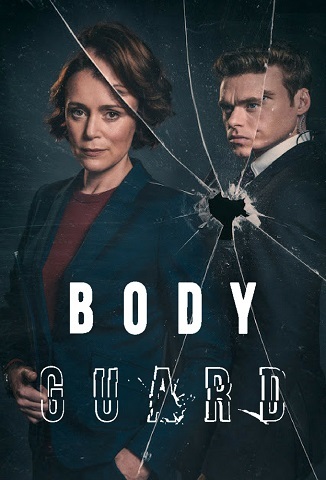 I was going to say that the Netflix series Bodyguard is brilliant, in my opinion, and quite a ride. I’m posting this here with my highest recommendations! We discovered the series Get Shorty by accident, and what a pleasant, hilarious accident it was. Callaghan and I both prefer this series to the film (1995). The infuriating thing is that we know there’s a season 2 out there, but we can’t figure out how/where to watch it!! Netflix doesn’t have it yet. How’s that for a so-called first world problem? At any rate, you may love this series, too. 5). 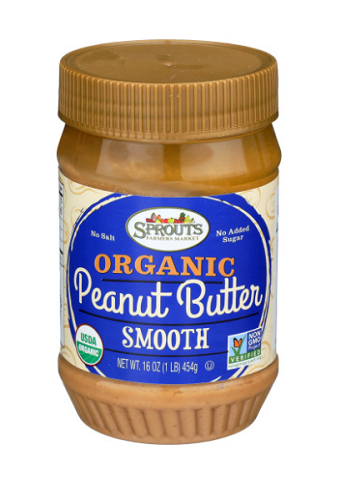 Sprouts Organic Creamy Peanut Butter. I don’t know how any natural (i.e. stir-it-yourself) peanut butter could differ from Laura Scudder’s Old-Fashioned creamy peanut butter, but somehow, Sprouts came up with one that does. Laura Scudder’s brand is good, but Sprouts’ is sublime. It has one ingredient: organic peanuts. Laura Scudder’s brand has peanuts and “less than 1% salt.” Close enough, right? But Sprouts’ creamy pb is easier to mix, its consistency is more indulgent, and its flavor is just perfection. Sorry, Laura Scudder’s. As long as Sprouts is making theirs, I’m never going back. 6). 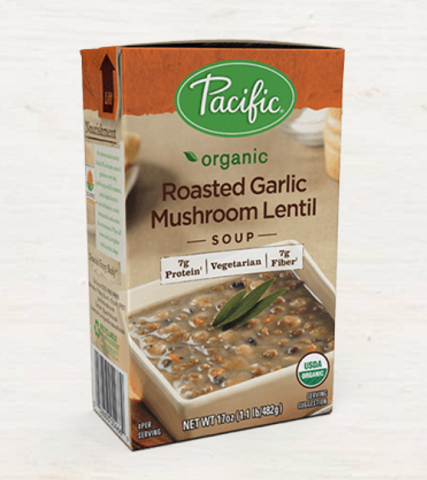 Pacific Organic Roasted Garlic Mushroom Lentil Soup. I’ve been sick since November 6 (yes, still sick, as it turns out), so I ate a lot of soup in November. I just wanted it, you know? Most of the time, when I want soup, I’m also not in the mood to make my own. My go-to, ready-made soup is Amy’s lentil or lentil vegetable. My new favorite soup, though, is this one by Pacific. This organic roasted garlic mushroom lentil soup is divine. I don’t think I would’ve discovered it had I not gotten sick, so thank you, forces of the universe. Dates, cashews, apples, almonds, pumpkin, cinnamon, nutmeg, allspice, and ginger. 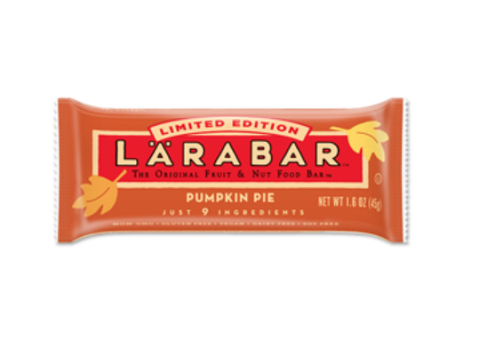 These are the ingredients mashed together to make Larabar’s pumpkin pie bars. The recipe works. These bars were perfect for November… for anytime, but especially for November. Love these! 8). 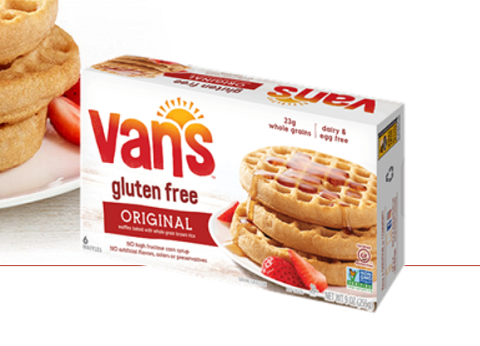 Van’s Gluten-Free Original Waffles. I discovered that Van’s gluten-free original waffles eaten hot with only butter (Earth Balance, in my case) taste like biscuits! These are wonderful. They’re crispy on the outside, and the inside melts in your mouth. Consider this post to be a Public Service Announcement. 9). 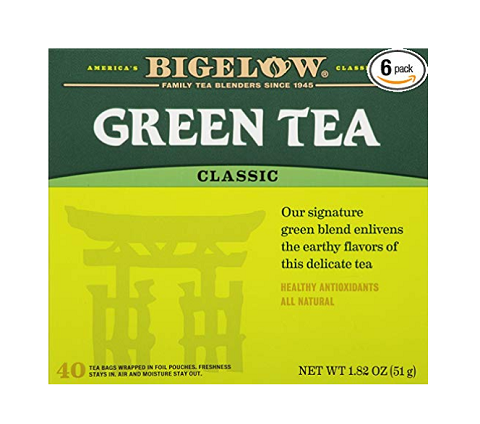 Bigelow Green Tea Classic. Another thing that happened in November as a direct result of my illness? I quit drinking coffee. That was a cold day in hell. It must have been. What happened was coffee started to upset my stomach to the point of I can’t do this anymore. Coffee’s never affected me like that! It only took two days of intense nausea and related trips to the bathroom. The first day it happened, I suspected that it was the coffee. The next day, it was obvious that it was the coffee. I started drinking green tea in the morning, instead, and now I’m hooked on early morning green tea. 10). 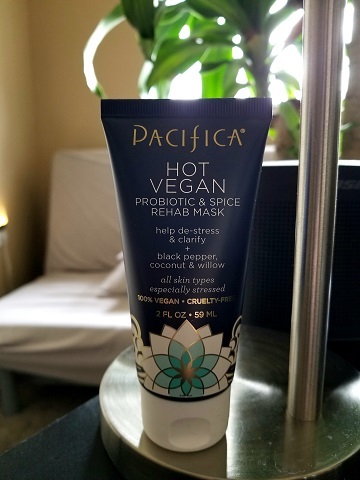 Pacifica Hot Vegan Probiotic & Spice Rehab Mask. I had no expectations when I picked up this daytime mask. Pacifica Hot Vegan Probiotic & Spice Rehab Mask kind of surprised me. I thought it might have a spicy sort of fragrance, but it does not. I thought that it would go on like a gel and feel like a gel, but it doesn’t… it glides over the skin, and it tightens up just a little bit. Just enough to remind you that you’re wearing it. It doesn’t dry into the aggressive, pulling second skin that many masks become the longer you wear them. I leave it on for five minutes longer than suggested, and the tightness of it doesn’t change. My skin glows after I rinse it off. I will be repurchasing this product! So there we have it for November’s favorite Little Things. Until next time! Happy Friday Eve.